Wise earns second straight All-ACC Academic selection – Pitt sophomore forward Brenna Wise received her second straight selection to the All-ACC Academic Team after posting a perfect 4.0 GPA in the fall 2016 semester. Wise also led the Panthers in scoring and rebounding for the second year in a row with 14.3 points and 6.3 rebounds per game in the 2016-17 season. Wrestling team dismisses Racciato – Senior 149-pounder Mikey Racciato was dismissed from the Pitt wrestling team prior to the ACC Championships for a violation of team rules. Racciato, a 2015 ACC Champion, went 11-8 in the 2016-17 season and finished with a 66-39 career record. Look for more information on these two dismissals in The Pitt News’ coverage later this week. 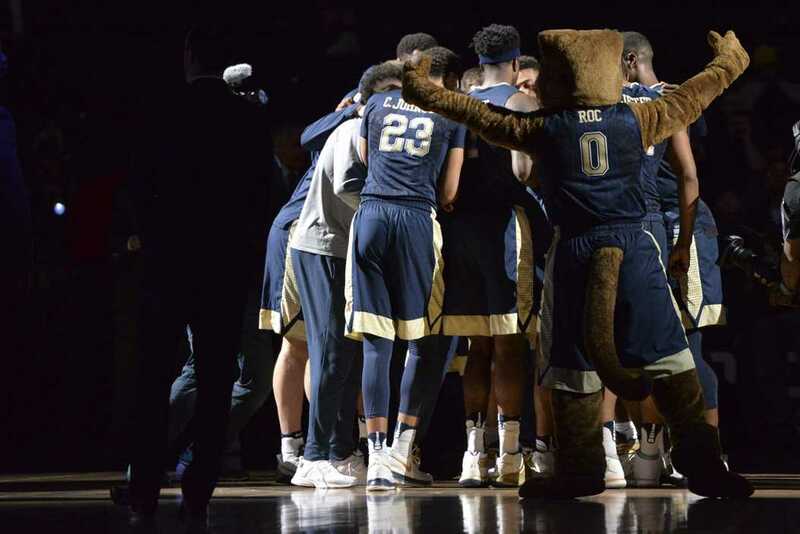 Panthers drop regular season finale at Virginia, 67-42 – The Pitt men’s basketball team put on its worst offensive display of the season in a 25-point defeat in the regular season finale at No. 23 Virginia, clinching the team’s first regular season with a losing record in 17 years. Forys, Rahmani, Campbell capture first ACC titles – Pitt junior 133-pounder Dom Forys, redshirt freshman 157-pounder Taleb Rahmani and sophomore 165-pounder TeShan Campbell took home their first individual titles at the ACC Wrestling Championships in Raleigh, North Carolina. The Panthers placed third in the team competition. Young named third-team All-ACC, Artis receives honorable mention – Pitt senior forward Michael Young made it onto the All-ACC Third Team for the second year in a row after averaging a team-high 19.9 points per game. Senior point guard Jamel Artis earned an honorable mention after finishing with a career-best 18.4 points per contest. Pitt softball team swept in opening ACC series at North Carolina – The North Carolina Tar Heels swept the Pitt softball team — ranked No. 21 in the nation at the time — in its opening series of ACC play. The Panthers lost 5-1 Friday and 6-2 Saturday before blowing a six-run lead in an 8-7 extra-inning loss Sunday. Pitt baseball team loses three out of four in South Carolina – The Pitt baseball team traveled to Spartanburg, South Carolina, for a set of four nonconference games and returned home with only one win. The Panthers fell to Wofford 4-3 Friday, then split a doubleheader Saturday against University of South Carolina Upstate, winning the first game 3-1 and losing game two 9-5. Pitt then lost to Wright State Sunday, 3-1. Pitt defeats Georgia Tech in first round of ACC Tournament, 61-59 – The Pitt men’s basketball team survived a late rally from the Georgia Tech Yellow Jackets to advance to the second round of the ACC Tournament with a 61-59 win in Brooklyn, New York. Panthers senior forward Michael Young led all scorers with 17 points. Panthers eliminated from ACC Tournament with 75-63 loss vs. Virginia – The No. 21 Virginia Cavaliers eliminated the Pitt men’s basketball team from the ACC Tournament with a 75-63 win in the second round. Virginia first-year guard Kyle Guy and Panthers redshirt sophomore guard Cameron Johnson led all players with 20 points apiece.